Origins is a short two-protagonist story, in which the outcome depends on what both characters decide to do. The player can control one protagonist at a time (while still seeing what the other character does), or can instead leave both option sets visible and swap control. I’m very interested to see this kind of experiment. Alex Warren submitted a piece with a similar concept to the IF Demo Fair back in the day, which I can no longer find a copy of online, but which is described here and here. But that was quite small. Origins is not long either, to be fair: I went through several playthroughs within the span of ten minutes or so, and the total generated text, including a finish which narrates the experience of both characters, ran about twice the height of my browser window. It’s not the case that this is about two independent tracks of decision-making, though. I originally wondered whether this was effectively a prototype for a possible multiplayer IF concept, but it isn’t: the choices of the two protagonists are linked, so that if you pick choice #1 for one protagonist, the other protagonist will also pick choice #1 (whatever that happens to be for them). Most of the choices are essentially variants on “how stressed out/rushed do you feel right now?” and “do you think it’s still possible for there to be a good outcome here?”, so it’s possible to have thematically equivalent choices within both storylines even though they represent different literal actions. If the choices weren’t paired, of course, the state space would be hideously larger to create, but when I discovered that linkage it slightly reduced my sense of the serendipity at work in the story. I think the experimental aspect comes through more clearly than the story/game aspects — both because the experiment is so obviously unusual and because the piece sort of hides the way in which it might be a game. It’s not immediately obvious what the goal might be, and while there is an ending that in retrospect I would regard as better than the other endings (so that I declared victory when I reached it), I couldn’t say that I was able to make a concerted plan to pursue that outcome while I was playing, or that I even realized that was what I should be trying for until after the first couple of playthroughs. I might have felt differently about both my goal and my sense of control over the situation had I been able to see the movements of the characters on a map and thus predict when they were likely to encounter one another — but of course that would have undermined the effect of dual viewpoints. Thematically, the strongest sense I got from this was that it was about chance and missed connections, with the rain sort of as an environmental agent with the potential to warp everyone’s experiences. It’s interesting to compare this against Raik and Krypteia, but to avoid spoiling I will insert some space before I say why. After the spoiler space I will assume you’ve played at least the beginning of all three of these games. At the core of all three games there is an idea of paired situations and thematic rather than literal equivalence of action. In Raik, that’s presented as a matter of translation between Scots and English, and between the experiences of an anxious person who is currently having trouble going outside and those of a bold legendary adventurer. In Krypteia, there are implicitly alternate metaphorical and literal meanings for the protagonist’s struggles. In Origins, it’s translation between the experiences of two individuals. This does put an extra cognitive load on the player, because it’s necessary to track two sets of events at once, sometimes in fairly short snippets. Switching back and forth between screens in Raik sometimes felt like extra work, and tracking Origins also meant not being able to read a continuous flow of prose. So there are some interface challenges to doing this kind of thing, but I’m intrigued that variants on that basic concept have now turned up in several comp games (and I’m only about a quarter of the way through the competition at this point). But perhaps it’s not so very surprising that this idea should be appearing right now. Hypertext games have given us many new conventions about relating to chunks of text not just as representations of an underlying model of objects, or as atomic nodes on a CYOA graph, but as phrases malleable in their own right and not necessarily moored to a single objective significance. 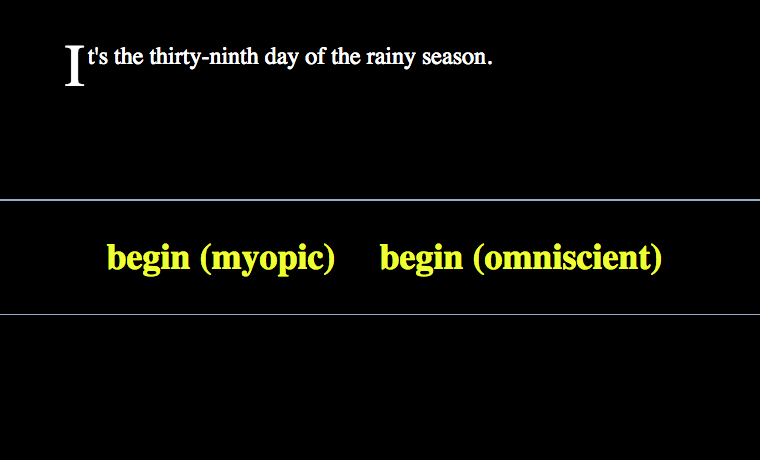 Twine has the convention of click-to-change text (where you can tweak an active word to change it to something else), and this invites the idea of burrowing into the words of a piece of text, pushing on them, challenging them, until either the full range of their possible meanings is exhausted, or the reader has selected one that she likes best. Anhedonia does this with its list of depression symptoms, and there are many many other examples. The mapping of action to action seems like a natural extension of that idea, to me: text is stacked on text, action is paired with action. Meaning emerges from the juxtaposition rather than from any single line. Other reviews of Origins: Joseph Geipel, Katherine Morayati.